The Chilean Patagonia is a region characterized by its amazing natural landscapes and by the incredible kindness and courage of its people. It is a geography marked by fjords, glaciers and wild rivers. Small towns and villages, separated by hundreds of kilometres of unpaved roads which in winter time are covered by snow and become impassable, mark a particular human ecology. Due to its remoteness and hard to access geography, the Chilean Patagonia is one of the most pristine ecosystems on Earth. This unique region is now threatened by energy hungry mines located in the north of the country. Several hydroelectric projects intending to dam Patagonian rivers have been proposed by private corporations to the Chilean Government. In May of 2011, Hidroaysen became the first of this projects to be approved by the country’s government, if built Hidroaysen would produce 2,750 MW of electricity by building 5 big dams in the Pascua and Baker Rivers. A year later, in May of 2012 Rio Cuervos project was approved, it intends to build two dams in the Cuervo River to produce 640 MW. Several other hydroelectric projects have been presented to the Environmental Commission and are currently being evaluated. Now in 2014 the Chilean courts and ministers have revoked the permission to build Hidroaysen, but the company that owns the project is still trying to find a way around it. Rio Cuervos is still entrapped in the Chilean justice system. Both of these projects were questioned by members of the parliament and civil society organizations who had doubts about the validity and quality of the Environmental Impact Studies presented by the corporations and the transparency and legality of the approval process itself. Magdalena Rosas Ossa is a courageous woman, she is a former climber, mountain biker, musician, cultural affairs expert and environmentalist. She is a Patagona (people from Patagonia) with the conviction to protect this region from the threat that would stop the natural flux of the rivers and destroy the peaceful lifestyle its inhabitants enjoy. In this interview we ask her about social movements, politics and why we must fight for a Patagonia without dams. When did you realize the ecosystems/rivers in Patagonia were endangered? The first sign we had was with the arrival of big corporations to the region. This happened during the 80’s, big fishing companies operating in our sea, extracting Merluza Austral (Merluccius cephalus). Big ships trawling everything, impoverishing our rich biodiversity. During those years, my partner and father of my children, Peter Hartmann, began to write about what was happening and calling the Region of Aysen as a Reservoir of Life. Also, in the same period, our neighbors in Gastre, Argentina, planned to build a nuclear dump station (Deep borehole disposal). We created in Aysen a big signature campaign and attended several bi-national meetings. Since then we are fully committed in the fight for Aysen as a Reservoir of Life. During the de facto regime of Augusto Pinochet our rivers suffered the first impact, water rights were privatized and disjointed from land rights. Peter wrote in every single media the dictatorship regime allowed, denouncing this situation. During the 80’s some groups defending the water rights and the rivers developed small campaigns, but it was not until the 90’s with the new democratic regime, that it was possible to spread the word about this issue in a big scale. The Chilean waters are not really Chilean, 90 percent of them is owned by transnational corporations (Endesa-Enel). We have showed our dissatisfaction with more than two decades of citizen’s demonstrations, campaigns, music festivals, artistic-ecological gatherings. The last ones were the first demonstrations against the privatization of water and big corporations in our region, during three days we occupied public spaces with music, sports activities and massive gatherings. Have you seen an evolution on how the civil society is confronting government and corporate policies/impositions? 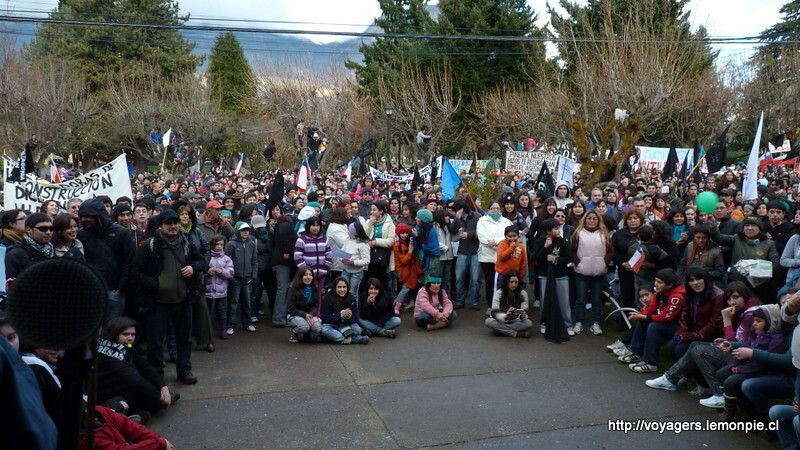 How do you feel about the civic and personal resistance which Patagonian people are expressing towards the hydroelectric projects in the region? Most of the Patagonian People do not want dams in our region, this place is unique and pristine, is one of the less polluted regions on Earth, its biodiversity, cultural and social heritage is unique in the country. We want a Patagonia Without dams because these projects imply the destruction of our unpolluted rivers Backer, Pascua and Cuervo. Imagine you are hiking and thirsty, you see this river and you can just drink the water straight away, without thinking about water contamination! Our rivers are amazingly pure! It is so disappointing that the Chilean politicians gave our water for free to the corporations, they want to build dams and then charge us for the electricity, a Chilean heritage destroyed and converted into foreign money, it is simply absurd!. But we are not alone, the Chilean society from the northern territory to the southernmost point is giving us their support. What changes have occurred after the HidroAysen project’s approval? The police repression has risen, as well as the number of police forces and resources in the Region. 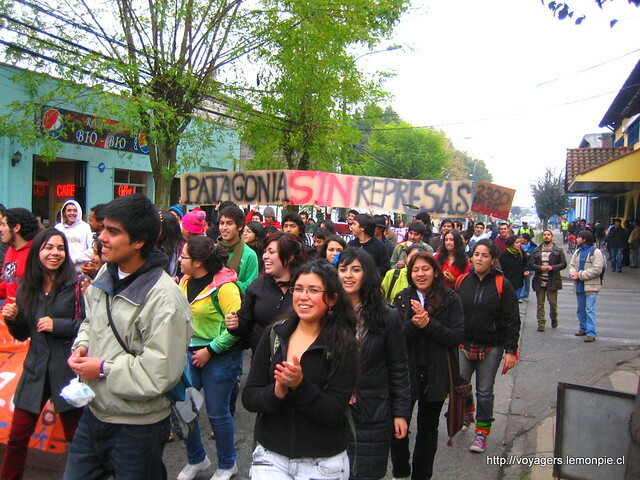 But most important: The people is fearless, they show up in the streets, fighting and asking for a Patagonia without Dams. Is there a sustainable management plan for the Aysen region? Does the Patagonian people have any project that they want to implement? There are many small projects in specific areas such as tourism, organic agriculture and natural buildings. I think our challenge is to put all these good projects into a single big idea and to push all together to protect our rights as inhabitants of this sparsely populated, vast and isolated region of Chile. For now at least, HidroAysen is out of the picture, but as a bad dream, every once in a while it appears again… did you know that the original project dates from the 1970s? It seems that we haven’t learned anything in 40 years. The civil society is already organizing an appeal with the Environmental Court, we can still hope for the best!